Does Cholinergic Urticaria Hurt or Itch? Cholinergic Urticaria often hurts and itches simultaneously during a reaction. The sensation is similar to that of a bee sting or tiny prick from a needle, while also having an intense itching sensation. It can be very frustrating to feel this sensation. People often feel an impulse to scratch, however, the scratching does not relieve the sensation. When Do Most People Develop Cholinergic Urticaria? Cholinergic urticaria can develop at nearly any age, in any race, any gender, and in any location of the world. Often, it occurs most frequently in the late teens or early twenties. However, some cases have been documented in toddler years, and others in older age (50’s-70’s). It tends to occur more frequently in men than in women. How Long Will I Have Cholinergic Urticaria? Will My Cholinergic Urticaria Ever Go Away? Cholinergic urticaria may go away at any time, and often does go away in most all individuals. Some individuals may have the condition for only a few months, while others have it for a few years, and others may even have it for decades. The condition may go away permanently, or may come back randomly throughout one’s life following a remission. In one study, the individuals followed retained the condition on average for 7 years. However, this number can vary greatly among individuals, and some may retain the condition for as long as 30 years or more. Others may only have it for a month or less. Is Cholinergic Urticaria All In My Head? Sometimes cholinergic urticaria sufferers are told the condition is “all in their head.” In reality, this is a real medical condition, with biological processes working behind it (just like any other disease or medical condition). The symptoms are very painful and real, and this is not imagined or “self created” any more than an allergy to pollen or peanuts is self created. Is Cholinergic Urticaria Fatal? Will It Affect My Life Span? At this time, there is no evidence to suggest cholinergic urticaria is fatal or has any negative effects on life span. Many individuals with this condition experience a total remission of all symptoms, and go on to lead a healthy and normal life. This is similar to other acquired allergic conditions such as allergies, etc. The only known negative health effects would be lack of exercise (since individuals experience hives when exposed to heat, they may avoid strenuous activities). This may lead to health risks as exercise helps reduce a number of medical related issues. In addition, some research has suggested that long-term use of antihistamines could increase the risk of brain cancer. Rarely, some individuals with cholinergic urticaria may also have another condition known as “exercised induced anaphylaxis.” This condition causes severe allergic swelling and reactions when the individual exercises. In addition, cholinergic urticaria has been associated with cancer, such as leukemia. However, this is extremely rare and does not seem to be the case for most sufferers. Treatments efficacy may vary for each individual. Some individuals choose to manage the condition naturally and do not seek medications. Others may choose antihistamines such as Zyrtec to help them treat cholinergic urticaria symptoms. Exercise therapy is another way to control symptoms, but this method may not be safe for everyone. Severe cases may require steroids, corticosteroids, or other treatments. Each individual should talk with a doctor or a specialists to understand what their treatment options are, and the potential side effects involved. 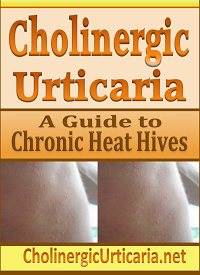 For more information on Cholinergic Urticaria treatments check out my other article called How to Treat or Cure Cholinergic Urticaria (Heat Hives). Why Do I Have Cholinergic Urticaria? Doctors are unsure how and why cholinergic urticaria develops in the first place. Some hypothesis that it could be related to stress, hormone deficiency (or over production), vitamin deficiency, genetic involvement, environmental or food allergies, unknown infections/parasites, or other potential reasons. In addition, it may be different causes for each individual. More research is needed to understand how and why cholinergic urticaria develops in the first place, before we can say for sure. At this time, there is simply not enough research or data to fully know all of the variables involved to understand why this condition develops. The most important thing is not the type of doctor, but rather, whether the doctor is familiar with the condition. Many choose to see dermatologists (doctors specializing in the skin), while others may choose to see a regular family doctor (general practitioner). Some choose to see allergists, endocrinologist, and more. The type of doctor is not nearly as important as finding a doctor that understands your condition and is willing to work on finding suitable treatments (if necessary). Dermatologists seem to be more familiar with cholinergic urticaria than most doctors, as they tend to see individuals with urticaria more frequently. However, any doctor who knows about this condition, and is willing to work with you can be beneficial. Also, if your doctor is not familiar with this condition, he or she may be able to refer you to a doctor who is familiar with it. It is very important to find a doctor who can explain this condition and give you relevant treatment options and potential medical tests. Is Cholinergic Urticaria an Allergy? Cholinergic urticaria is typically classified as a hypersensitive response to heat (increase in body temperature). It is generally not classified as an allergy like food allergies or environmental allergies. Some studies conducted suggests that cholinergic urticaria may have different subsets, of which one does show a positive response to analogous sweat. However, it is still unclear whether or not an actual allergy to sweat or acetylcholine is what causes this condition. It could be weak mast cell membranes in the skin, or other potential reasons. More research is needed for this condition. At this time, there is no strong evidence to suggest this is caused by food allergies, or environmental allergies. It seems to be an internal condition caused by internal factors. Is Cholinergic Urticaria Diet Related? Cholinergic urticaria may be related to diet in some individuals. Many have reported a worsening of symptoms when eating certain foods. However, it is unclear whether this is true for all sufferers. The author of this site has used diet to eliminate symptoms of cholinergic urticaria. It is a relatively hypoallergenic diet that removes most of the common allergens. It is also very low in sodium and histamine. The diet consists of turkey, sweet potatoes, broccoli, white rice, strawberries, blueberries, and bananas. In addition, spicy, acidic, or vinegar-rich foods can cause a temporary increase in body temperature, which could cause a hives reaction in individuals with heat hives. Is Cholinergic Urticaria a New Disease? How Long Has This Disease Existed? There are no known documented cases of cholinergic urticaria (specifically) from ancient times, however, it is possible that this condition has always existed. Urticaria is first documented in Hippocrates’s age, however, it is unclear what subsets of the physical urticarias may have existed at that time. The first published (or documented) description of cholinergic urticaria dates back to 1924. This specific urticaria seems to have only been seriously documented or studied within the most recent decades. Many physicians and medical professionals are still unaware of the condition, which often leads to misdiagnosis. Individuals often suffer months or even years without knowing what is wrong. Hopefully this condition will be studied in more depth, and will be more well known by all medical professionals in the future. Is Cholinergic Urticaria a Disability? Cholinergic urticaria is a serious and sometimes debilitating condition. Some individuals may experience very severe symptoms, while others experience only minor symptoms. For those with severe symptoms, it may be necessary to avoid physical activities, alter career choices, and even seek temporary aid or support from friends, family, and others. Individuals with this condition often need a great deal of support from friends and family while they learn to cope with the new disorder. This may even include temporary financial support while one changes careers, or seeks treatments. Cholinergic urticaria can be difficult for younger individuals. If your son or daughter has cholinergic urticaria, you may want to take steps to help them manage their condition. You may want to consider talking to the principal or gym teachers (or sports coaches) about this condition. Students with severe symptoms may need to be excused from all physical activities. In addition, teachers may need to know that students may experience random attacks, and it may be better to not call on those individuals, force them to do projects in front of classes, or do anything that may cause a reaction. In addition, your child may need additional emotional support while they are adjusting to living with a newly acquired medical disorder. I urge all parents to be loving and supportive, and to do all you can to help make your child’s life more enjoyable and their hives more manageable.